Anyways, I will soon be starting a series on the most important habits of highly effective part-time investors. 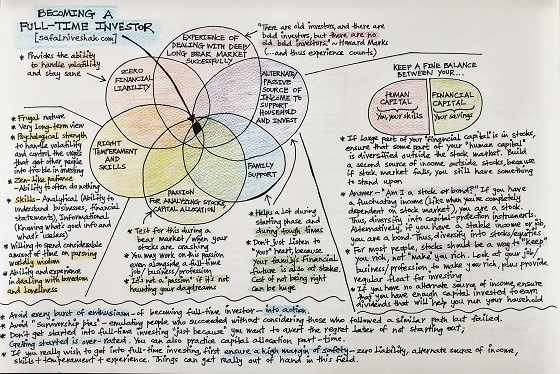 But first, to answer the question of how one can prepare to become a full-time investor, here is a checklist I have drawn for people who want to ignore my warnings and get into full time investing (though I have already written a detailed post on why you must not quit your job to become a full-time investor). In this checklist, especially note the consequences of getting it wrong. Checklists save lives, in aviation and medicine, and also in tasks that involve a lot of biases and uncertainties…like investing. Investing requires minimal activity, the less the better. How can that be ‘full time’? Well, you need to ask those who wish to become full-time investors. But this checklist is for those who get down to doing nothing but researching stocks and finding ideas, often to invest their own savings to start with and then take up an advisory, fund management role etc. Investing Action is Minimal activity , but deciding where , when & how much to invest is lot of hard work . It requires one to study annual reports of many companies that too across time periods to select one investment . Then one has to track industry developments , new innovations and read research papers of technology and other areas that impact that industry . It becomes very difficult to do with your job as then you will have sacrifice on family time or compromise on your job duties . That said Quitting Job to Invest Full Time does not make sense unless you enjoy ” process of studying business” and one has to back up income in form of Dividends and Interest equal to atleast 1.5 time your annual salary. By looking at your diagram, at least the hurdles are clear for me. Now I can devote more time on removing those hurdles, though i don’t have any plans to become full time investor but your post tells all the vulnerability one might face in this process. I am huge fan of your articles, and I must admit that it has changed my perception towards stock picking and looking at businesses from perspective other than just numbers! Thanks for this article Vishal. I am trying to be patient and I am glad you’re helping me in my endeavour! Beyond the science of investing, success in investing requires an innate sense and ability to pick the right stock (apples have always been falling down but only Newton had the innate sense to read into this phenomenon and come up with the law of gravity) and psychological control on one’s thinking apparatus (not acting on impulse but using system 2 thinking mode of Daniel Kahneman). Having adequate supply of cash to survive the bad times without the need to liquidate one’s long-term investments is a sine-qua-non. The ability to identify the right investments that provide more than adequate returns along with the ability to avoid investments where one may, in fact, experience capital erosion is an absolute must. The checkpoints mentioned are very relevant and truly insightful. Becoming a full-time investor is not such a bad idea if one is fully prepared for it. And getting oneself fully prepared means one has to be ready for the long haul. Starting with baby steps can help mitigate the risks and overcome the challenges. This checklist can certainly help towards that. Thanks for sharing your thoughts here. Regards. Very well written Post Vishal !! Lot of gullible investors/first timers want to get into this without any checklist or preparation. Everyone wants to become Warren Buffett without understanding that it took him 50+ years of serious and dedicated hard work. I think this article can be an eye opener for such people. Glad to know that Prasanna. Thanks! I had wrote this matter to you 5 months back. I am preparing. Step by Step. A big dreamer to become a full time investor. Have been in the market since 2014 and still learning. I think it’s the best time to take the risk for me. Just pray for me. Oh there’s people who still think stocks is the only investment. Investing is also a full time activity. Even if you read all articles from this site or all letters of Warren Buffet, merely investing based on theory or past performance will not ensure good return or it may cause even lose of capital. So careful investment with lots of money will fail unless it is full time activity.